Separation anxiety in dogs is an issue that effects many pets and can cause great stress not only for the dog but for the owner as well. Yet it isn't as common as we may think. Separation anxiety can manifest itself in the dog chewing furniture, constantly barking, digging and generally being destructive. In some cases this behaviour is stressed induced but, although a huge number of dogs may exhibit the signs and symptoms of dog separation anxiety, many of those symptoms or behaviours are caused by boredom which can be addressed and rectified. Separation Anxiety In Dogs Or Just Boredom? So how do we know if our dog is genuinely experiencing stress or is just bored silly? Really it is probably about degrees of behaviour rather than anything else. In clinical dog separation anxiety the behaviour will be much more destructive and the dog may even harm itself by biting or clawing. Added to this the barking will not be a bark but more of a howl. If this is the case than you really need to seek the advice and support of vet or animal behaviourist as soon as possible as the dog is genuinely ill and suffering severe stress when separated from it's owner. Fortunately, this severe behaviour isn't as common as we think and what we think of being separation anxiety in dogs is really just the dog saying he is bored and relieving his boredom by chewing or demonstrating other similar behaviour. I know that you may be shaking your head at this point as you remember the state of the sofa when you arrived home from work but honestly it can all be sorted out. Just don't buy a new sofa until it is! Alleviating boredom in a dog isn't easy but it can be done. Your Labrador training regime will help here but of course the best solution is to not leave the dog in the first place but we all need to work and leave the house for social reasons occasionally! If you do have to spend extended periods out of the house for work try and call back at lunch time if possible or perhaps ask a friend or neighbour to pop in and take the dog for a quick walk. Also make sure the dog has access to plenty of toys including a Kong filled with frozen treats. If you can leave more than one Kong or similar type of toy so much the better. These kind of toys can keep a dog occupied for hours. The most important point is to not leave your dog home alone too soon. You need to build a strong relationship first before he will trust you enough that he knows you will be coming back for him. 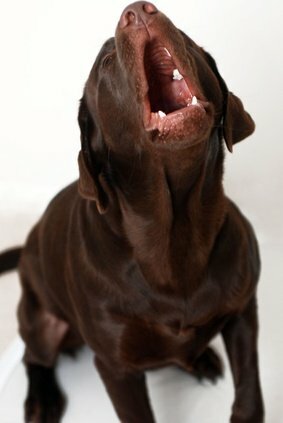 For further information you may like to visit our p[age on Labrador retriever behavior problems. We haven't mentioned problems with dogs going to toilet whilst you are out. Obviously if you leave a very young puppy alone you are asking for trouble but once the dog is over the age of six months bladder control shouldn't be a problem. Of course one of the first things you should do with a dog is to toilet train him. Making sure he can 'perform on demand' before you leave the house will avoid all accidents of nature.